Make learning fun by setting up themed learning activities! This October, work on various math skills from counting to addition to fractions with this collection of Halloween Math Activities! 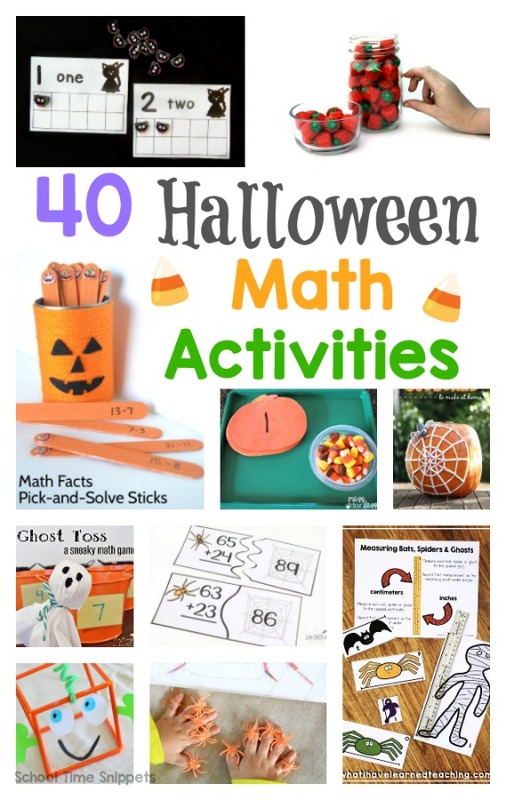 These Halloween math ideas are sure to be a hit! I mean, counting googly eyes is wayyy more fun than counting numbers on a wall! Measuring is more fun when Frankenstein is involved! And, addition is more fun with flying ghosts! 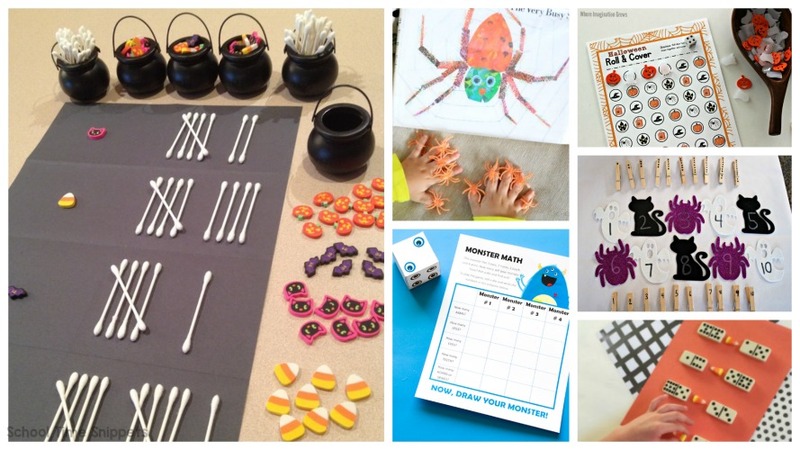 Enjoy this collection of fun, hands-on Halloween Math Activities! Spider Counting Book from Fun-A-Day. Make counting fun this Halloween with a printable spider counting book! Counting Spider Rings from School Time Snippets. Use Halloween rings to practice counting to 5 or 10! Spider Counting Game from School Time Snippets. This Halloween math game is fun and easy to put together! Spider Numbers Matching Game from School Time Snippets. Make a memory game with spiders and googly eyes! Spider Double Digit Addition Puzzles from Life Over C's. These puzzles are a fun change from pen and paper! Spider Pattern Block Mats from ChickaDeLit. Enjoy these creepy crawly pattern block mats! Spider Equations from Mr. Elementary Math. Write a number in the middle and make spider legs showing equations equaling that number. Pumpkin Patch Counting Craft from School Time Snippets. Here's another fun counting activity using fingerprints to make pumpkins! Add 10 Pumpkin Patch from Inspiration Laboratories. This dice game is great for Kindergartners, 1st Grade, or 2nd Grade. Pumpkin Geoboard from Dayna Bayna. Such a clever and unique way to make shapes! Pumpkin Shape Puzzles from School Time Snippets. These printable shape puzzles are great for little hands. 3-D Spookley Pumpkin Math Activity from Buggy and Buddy. Great way to introduce geometry! Pumpkin Pick & Solve Addition Game from Creative Family Fun. Addition facts are always more fun when a game is involved! Pumpkin Patch Arrays from School Time Snippets. This festive Halloween math activity is a great way to teach multiplication! Pumpkin & Ghost Addition from Gift of Curiosity. I LOVE these cute pumpkin and ghost rock counters! Ghost Toss Math Game from Crafting in the Rain. Here's a great Halloween math game to play with kids of various skills. Spooky Sums by Nurture Store. I LOVE this addition activity! Halloween Ghosts Felt Board from Preschool Tool Kit. 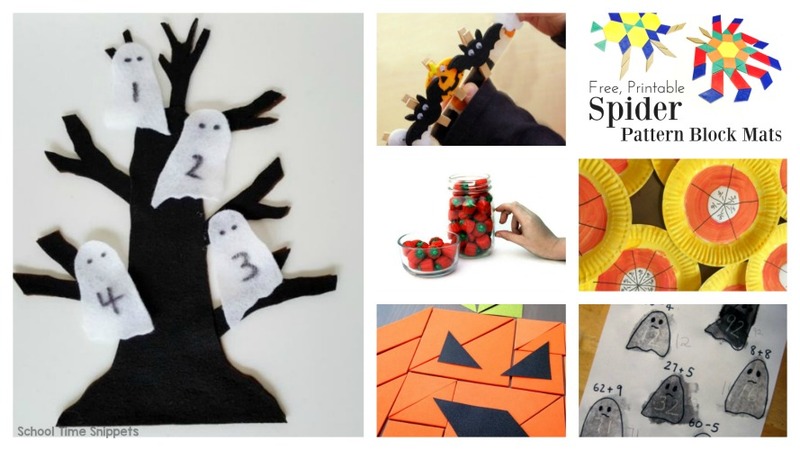 So many ways to practice math skills with this Halloween felt board! Haunted House Math Activity from No Time for Flashcards. Kids will love learning numbers, number words, and/or solving simple equations with this Halloween math activity! Candy Corn Counting Puzzles from Teach Beside Me. This printable set is a fun way to practice counting! Candy Corn Counting from Mess is for Less. This hands-on counting activity using candy corn is a winner! Halloween Candy Patterns from Simple Fun for Kids. Use left-over Halloween candy and work on patterning skills! Estimating with Halloween Candy from Inner Child Fun. Using Halloween treats is a great way to make math fun! Candy Corn More Than/ Less Than from Planning Playtime. Add and determine if the number is more than or less than with candy corn! How fun! Candy Corn Fractions from Teach Beside Me. Don't eat these! 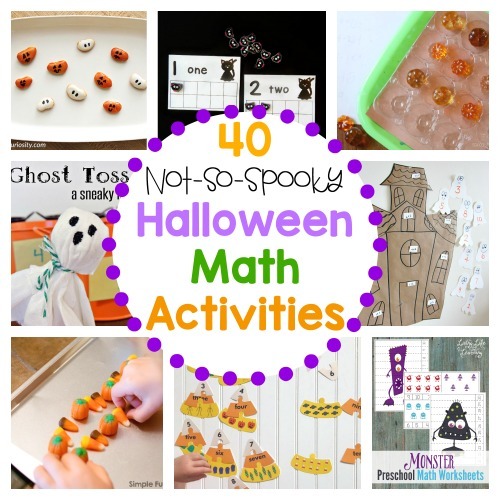 But this Halloween craftivity is hands-n way to teach fractions! Monster Dice Game from Measured Mom. Use these not so scary monster printables to practice number recognition and more! Googly Eye Math Game from School Time Snippets. Counting googly eyes is a great way to make Halloween math fun! Monster Math Worksheets from Living Life and Learning. Here's a fun not-so-scary monster math printable pack for preschoolers! Monster Math Cards from The Educators Spin On It. These number cards can be used a variety of ways to learn math skills. Draw a Monster Art & Number Game from Adventure in a Box. Add a little art to your math activities while working on number writing, counting, and more! Number Monsters from School Time Snippets. Fun creative math activity for those learning numbers 1-10! Halloween Counting Cards from Kindergarten Connections. Enjoy these low-prep counting cards for Halloween! Halloween Math Counting from Mess for Less. Great math activity that works on fine motor skills, too! Halloween Roll & Cover from Where Imagination Grows. My kids love roll and cover math games; they are so simple to play & a great way to sneak in math skills! Halloween Math Pack from Happiness is Homemade. Work on number tracing, addition, patterns, and more! Halloween Tangrams from Little Bins for Little Hands. Make a pumpkin, cat, haunted house, and more with tangrams! Fun Halloween STEM activity! Tally Bones Graphing from Miss Giraffe Class. Did you know q-tips make great "skeleton bone" manipulatives?! Such a fun way to work on tallying math skills! Q-Tip Shapes from ABCs to ACTs. Skeleton bone shapes is a great hands-on activity for little ones! Halloween Measurement Activity from What I have Learned. Kindergarten, 1st & 2nd graders will love to measure these fun Halloween characters. Halloween Pattern Sticks from Lalymom. Love this festive Halloween twist to learning about patterns. What Halloween Math Activity do you plan to set up for your child this holiday?